SAN DIEGO, CA — Dr. Jay Desgrosellier, assistant professor at UC San Diego’s department of pathology and Susan G. Komen-funded researcher, recently published a new therapeutic approach that could stop breast cancer from metastasizing. The majority of breast cancer deaths occur because of metastasis. Women and men with stage IV breast cancer are relying on research advancements to beat this disease. In 2017 alone, Komen invested $31 million in 98 new grants focused on metastatic and late stage breast cancers. The grants include over $1.9 million in new funding in California, bringing Komen’s total research investment in California to over $79 million since 1982. 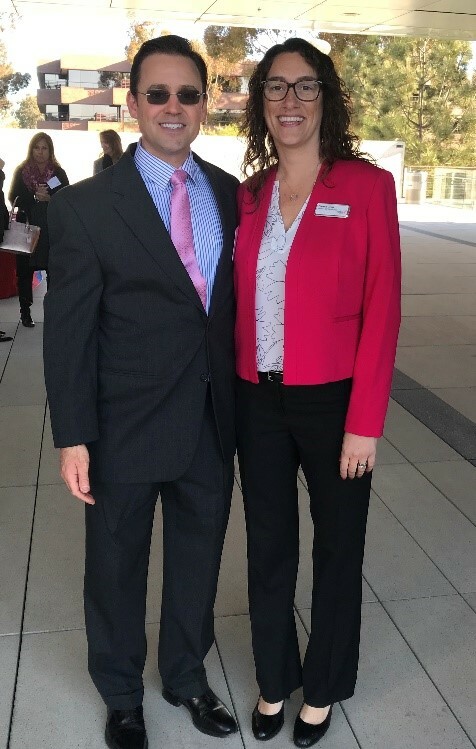 Pictured above from left to right: Komen-funded Researcher, Dr. Jay Desgrosellier and Susan G. Komen San Diego’s President and CEO, Shaina Gross. We are thrilled that one of those research breakthroughs is happening here in San Diego by Desgrosellier. “If we are going to make a difference in the number of people who die of breast cancer, we need to stop metastasis and we think we have a way to do it,” said Desgrosellier. Desgrosellier and his lab have been studying the stem cells in the mammary glands that play a role in pregnancy-related breast changes and the role similar cells hiding within breast tumors might be playing in the development and spread of breast cancer. As it turns out, it is very easy for cancer cells to travel throughout the body using the bloodstream or lymphatic system. However, not all cancer cells are the same, they all have different functions and capabilities. Only stem-like cancer cells have the ability to travel and form a tumor. “We believe these stem-like cells are able to survive treatment with traditional chemotherapies, allowing them to spread through the body and seed the growth of a new tumor in a new location,” said Dr. Desgrosellier. His lab’s objective is figuring out how to eliminate these ‘stem-like’ cells from aggressive breast tumors possibly leading to the reduced recurrence of metastasis. Back in December 2017, Dr. Desgrosellier announced a new therapeutic approach that could stop breast cancer metastasis from forming and spreading. His lab’s focus on rare stem-like tumor cells led them to discover a vulnerability in the path way that powers them, offering a strategy to target these cells using existing drugs before metastatic disease occurs. He presented on this breakthrough at Susan G. Komen San Diego’s Concept to Cure Conference this February. Dr. Desgrosellier is a recipient of the Susan G. Komen Career Catalyst Research Grant. He is dedicated to making a difference in the lives of women with breast cancer one breakthrough at a time. Next to the U.S. Government, Susan G. Komen is the largest funder of breast cancer research. Since 1982, Komen has funded $920 million in breast cancer research – that’s more than any other nonprofit in the world. “If not for Komen funding, I wouldn’t be able to do this research. It’s been an enormous help and I’m very thankful to Komen and its donors for their support,” said Dr. Desgrosellier. If you would like to help us continue the support for breakthrough research along with vital breast health community resources in San Diego, click here to donate.